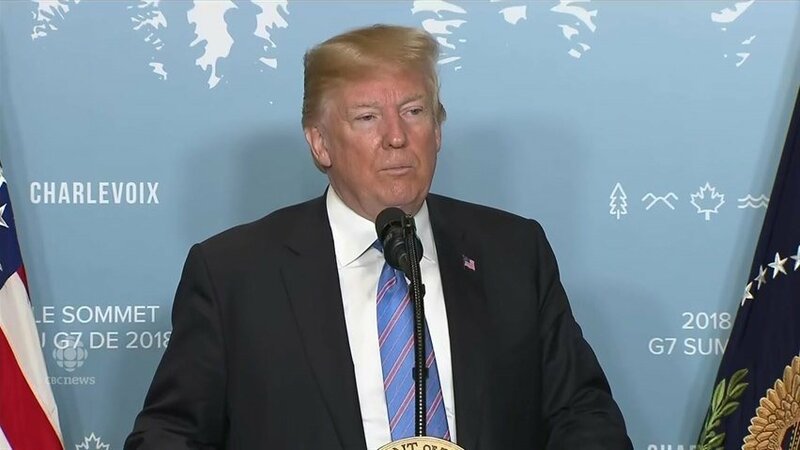 Donald Trump’s leaving the G-7 summit without budging an iota on protectionism is indicative of the disunity among the leading capitalist countries on the strategy to overcome the capitalist crisis. Donald Trump’s leaving the G-7 summit without budging an iota on protectionism is indicative of the disunity among the leading capitalist countries on the strategy to overcome the capitalist crisis. Trump has decided that the U.S. would go its own way, by enlarging the fiscal deficit, not just for giving tax concessions to the corporates, which would have little demand-stimulating effect anyway, but also for increasing government expenditure which would have this effect, and at the same time by protecting the domestic market. These two strands of Trump’s strategy have to go together. In fact in the absence of protectionism, any fiscal stimulus within the U.S. economy, such as what larger government expenditure would provide, would leak out of that country by creating larger import demand for other countries’ goods, in which case the U.S. would be generating employment not at home but abroad, and also incurring a debt to those very countries for doing so. But a larger fiscal deficit that is combined with protectionism ensures that jobs are created at home and no external debt is incurred for the purpose. Trump can afford to undertake this strategy because of the position of the U.S. in the capitalist world. Any other country pursuing such a strategy of enlarged fiscal deficit along with protectionism would witness an outflow of finance as the “investors’ confidence” in that country would be undermined. But the U.S. is on a different footing: its currency is still considered “as good as gold” despite not being officially so ordained (as it was under the Bretton Woods System); and it constitutes for a variety of reasons the home base of finance, from where, unless there are strong provocations, finance would not like to move out. Trump is thus exploiting this position of the U.S. as the Monseigneur of the capitalist world, together no doubt with some increase in the U.S. interest rate, to push through a strategy for U.S. revival alone, with no thought whatsoever for the revival of the capitalist world as a whole. What is wrong with this strategy is not the usual baseless claim like “protectionism is bad”, that “free trade is good”, or that this strategy represents “nationalism” which is reactionary as opposed to “internationalism” which is progressive. What is wrong with this strategy is that it would not work even for the U.S. (though it may appear at present to be succeeding), let alone for the capitalist world as a whole. This whole discourse about “nationalism” versus “internationalism” is not only analytically wrong, because these terms cannot be defined without reference to their class content (“nationalism” for instance is not one homogeneous category and Ho Chi Minh’s “nationalism” is quite different from that of Hitler); it is also ethically unfounded: if higher levels of employment could be achieved everywhere, together with higher levels of welfare expenditure, by each country following a “nationalist” strategy, as compared to a situation where they are trying in vain to pursue an “internationalist” strategy, then cavilling at such a “nationalist” strategy is clearly indefensible. At present the Trump strategy, many point out, appears to be working in the U.S. The unemployment rate is officially down to around 4 percent. Even though the work-force participation rate continues to be below what it was before the 2008 crisis, so that, on the assumption of an unchanged work-force participation rate, the unemployment rate would be just over 6 percent, this rate itself, they suggest, represents a decline compared to a few years ago. At the same time, though Trump has used the fiscal deficit to please the capitalists through tax-cuts, he has not, they suggest, stinted too much on social spending. And yet, notwithstanding these supposed boom conditions, the inflation rate is quite low, and the dollar continues to be strong. Let us, for argument’s sake, assume that all these claims about the success of trump’s strategy are true, though a moment’s reflection would show that all of them cannot possibly be simultaneously true. It is impossible in other words to have a co-existence, except only transitorily, of the following four characteristics: a low unemployment rate, a large fiscal deficit, a policy of protectionism, and a low inflation rate. The first three of these would cause excess demand pressures that would push up the inflation rate, which would no longer remain low. But let us assume that all four claimed features are true. But all these features are only the first round results of the Trump strategy. Other countries, those hit by U.S. protectionism, would not just sit back and accept the increase in unemployment which the U.S. strategy of going it alone is exporting to them. They would soon start taking offsetting measures through larger fiscal deficits of their own together with the necessary protectionism. In their case however such measures would entail a flight of finance, as they lack the Monseigneur status that the U.S. enjoys. They would therefore either have to put controls on financial flows, i.e. “capital controls”; or jack up their interest rates to entice finance not to leave their shores. Capital controls however would strike at the very root of the current globalization. It is noteworthy that even Trump with all his protectionist measures against the imports of goods and services, has not put restrictions against the free flows of finance. Likewise, the other capitalist countries would be loath to restricting capital flows across their borders. They would therefore resort to interest rate hikes to prevent any outflows of finance. Such hikes in interest rates would nullify to an extent their efforts at expanding demand to bring down increase in unemployment because of U.S. protectionism; and it would also bring about a corresponding increase in the U.S. interest rates. What appears at present to be a “trade war” started by Trump, and is being discussed, and derided by his opponents, as such, would soon take the form of competitive hikes in interest rates, of which the current rise in the U.S. interest rates would have been the first symptom. And such hikes would nullify for all capitalist countries taken together, including for the United States, whatever gain in employment an enlarged fiscal deficit and protectionism might have caused. What the current conjuncture clearly shows is that it is impossible to overcome the capitalist crisis without impeding free global financial flows, which means shaking off the hegemony of globalized finance. The Trump strategy does not aim at shaking off this hegemony; and unless the other capitalist countries are willing to shake off this hegemony, they would all be engaged in a competitive struggle of interest rate hikes which would collectively entail no improvement in the situation of the world capitalist economy. There are only two possible logical ways in which the world capitalist economy can come out of its current protracted crisis. One is for a co-ordinated fiscal stimulus by all advanced countries, of the kind that Keynes and a group of German trade unionists had suggested during the Great Depression of the 1930s. This of course would be stoutly opposed by international finance capital, which opposes all direct State activism that does not work through itself; but unity among the leading nation-States, which could, through such unity, act as a surrogate world State, could conceivably overcome this opposition. But nobody in G-7 is even talking about this strategy, which means that it is not on the agenda of the capitalist world. Any attempt at pursuing it, since it would have to overcome the opposition of international finance capital, which capitalism is incapable of doing, would necessarily have to entail a transition beyond capitalism, i. e. a transcendence of capitalism in the very process of overcoming its crisis. The second logical way is if particular countries decided to go it alone, as Trump is trying to do. But for this to succeed, capital controls would have to be put into place, for, otherwise, the prevention of capital outflows as a fall-out of such going it alone (which would necessarily require fiscal activism that finance is always opposed to) would push the country, and its rivals, into competitive interest rate hikes, which subvert, both individually for particular countries and collectively for the capitalist world as a whole, the prospects of economic revival. Trump’s apparent economic success with the U.S. economy, if at all there is any success, which itself is doubtful, represents therefore only the first stage in this competitive struggle; this success is bound to get negated as others react to his moves. Since neither Trump nor his rivals are even thinking of any restrictions on capital flows, which would undermine the hegemony of international finance capital and is ruled out for this reason, the structural crisis of capitalism is bound to continue, notwithstanding all appearances to the contrary.